Winning a scratch-off ticket is more likely than scooping the main prize in a regular lottery, but this doesn’t mean that players are favorites to walk away with money when buying them. What makes them so popular is the fact that only a couple of seconds after buying them, players find out whether they won anything or not. Cary Collings is one of those who like this system a lot and now that he won two sizable prizes in the same day it is only fair to assume that he is a big fan. 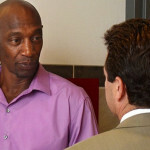 This is the slogan of most lotteries but what usually happens is that players only mildly improve their chances to win. 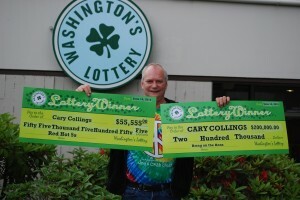 Cary Collings on the other hand is the living proof that it is possible to win $200,000 on a scratch-off ticket only a couple of hours after scooping a prize worth $55,555. Early in the morning, he thought it was a good idea to buy a Washington lottery ticket and discovered in disbelief that this brought him an amount sufficient to pay all outstanding debts. the rest of the winnings into a bank account. It doesn’t happen very often for lottery players to win a quarter $1 million in scratch off lottery games, but Mr. Collings is not the only one who beat the odds. 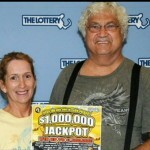 18 years ago, Kerry and Diane Carmichael won $2.5 million in Arizona lottery, and a couple of months ago they won another jackpot, this time worth $1 million. 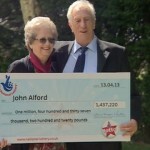 Terry and Stephen Weaver from Arkansas have a similar story to Collings’ with the exception that they won two lottery prizes within a week. The first was a massive jackpot of $1 million, with the second price being 20 times lower, but then again $50,000 is not an amount to frown upon. Some Europeans were just as lucky and George Traykov from UK has something to brag about as well, as he won a major EuroMillions Lottery prize twice in just three years. These success stories serve the purpose of fueling the enthusiasm of players and ignite hope that something as expensive and accessible as a scratch-off ticket can make you rich overnight.